As a coastal seaport city on the mainland of British Columbia, Vancouver is currently the eighth largest Canadian municipality with the third largest metropolitan population in the country. Forestry is its largest industry with tourism a close second. But over the last few decades, Vancouver might be better known as the desired locale for many famous films. As far back as the late 1970s, major film production companies were transforming Vancouver into a second filming city, earning it the nickname "Hollywood North." Much like the Hollywood "South" in Los Angeles, Vancouver is a very desirable place to live — but that comes with a cost. As one of the Top 5 worldwide cities for livability and quality of life, currently the average house price in metro Vancouver is $670,300, according to an article on globalnews.ca. Maintaining a property becomes even more of a priority in a high-end market. 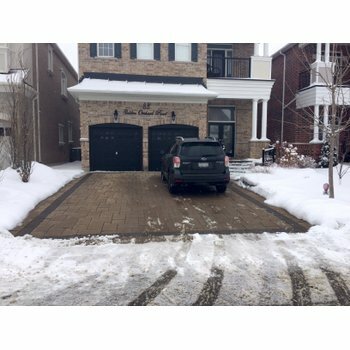 In "Hollywood North," you might expect to find lavish, expensive upgrades throughout the home because it's such an upscale area. 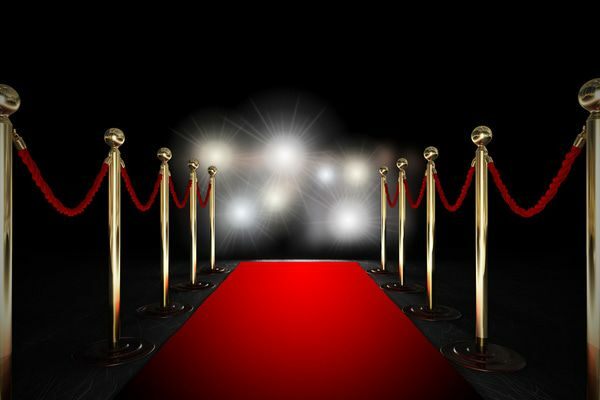 However, Vancouver residents can increase the resale value of their homes while enhancing their lifestyle with the affordable luxury and comfort of radiant floor heating, proving that radiant heating isn't just for those who walk the red carpet. Radiant heat might not seem like a necessity with the average winter temperature at 6 degrees Celsius (43 degrees Fahrenheit) in December and the low just over the freezing point in Vancouver; however, Vancouver winters are often dark due to the city's high latitude, resulting in earlier sunsets. With little sun to heat up the home exterior, electric floor heating is the perfect solution to warm up cold surfaces, such as ceramic bathroom tile or stone kitchen floors. On Vancouver Island, a City Tile Limited customer opted to install TempZone™ Cable in their 215-square-foot kitchen. Based on Vancouver Island, the tile distributor provided the flooring and WarmlyYours Radiant Heating provided the in-floor heating. 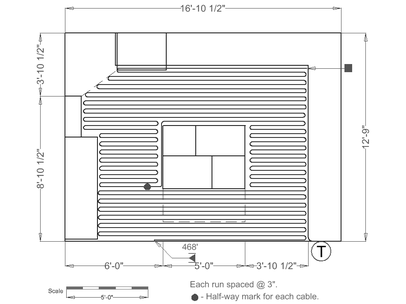 Although the kitchen space was large, it only took one spool of TempZone™ Cable to heat the 117 square feet of floor space, as is shown in the floor plan. By spacing the cable in 3-inch intervals, the system radiates 12 watts per square foot. 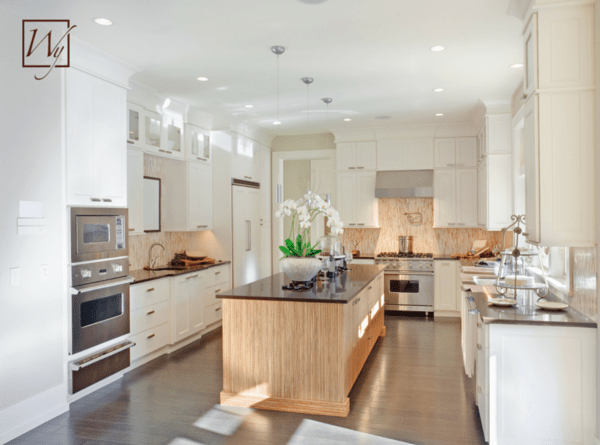 Using cable also allowed the homeowner to fill the maximum amount of floor space in the kitchen — including the space immediately surrounding the island. With a kitchen covered in warmth and upscale flooring, the room was able to fit the bill as a high-end, Hollywood-status space — at an affordable price. It cost less than $1,000 to heat the floors of this large kitchen. For 468 feet of 120-volt TempZone™ Cable, it cost $700. That equates to about $6 per square foot! To add a SmartStat™ programmable thermostat, it cost $169, bringing the total to $869. Furthermore, the cost to operate the system is low. It costs about 55 cents a day to heat the kitchen, according to WarmlyYours' Energy Use Calculator. This tool factors in the average kWh cost in Vancouver, which is just shy of 9 cents. During the coldest month of the year, it costs about $16.27 to run the system. All year long, it's estimated to cost about $123.58, according to WarmlyYours' Heat Loss Calculator. 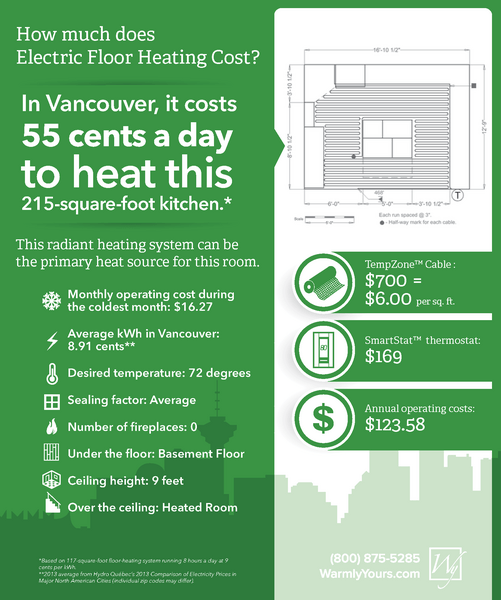 In addition to factoring in the average kWh cost in Vancouver, this tool considers the desired room temperature, sealing factor, surrounding rooms and insulation factors to estimate whether radiant heat can be the sole source of heat in a room and how much it will cost to operate. This system can be the primary source of heat for the room, so there won't be any additional heating bills for this area, which is an added benefit. For those who don't mind spending a little bit more money in order to save time installing the product, TempZone™ Flex Rolls are also available. In this Vancouver floor plan, a 1.5- by 76-foot Flex Roll would have offered 97 percent coverage compared with TempZone™ Cable's 100 percent coverage, but Flex Rolls embed the cable in green mesh, which makes it easier to install. At $1,026, the Flex Roll would have cost $326 more than the Cable, but it also boasts a higher wattage of 15 watts per square foot. This means the floors would heat up faster and generate more heat per square foot. 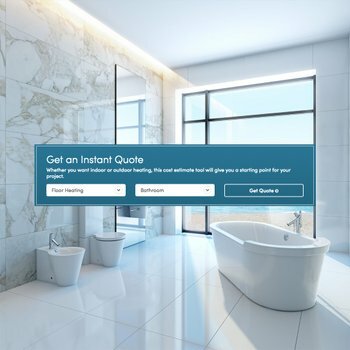 To determine which system is best for your room, and to find out how much it will cost, check out our Instant Quote tool online. You can also submit your floor plan online or by email or fax to an account manager in order to get a quote as well as a custom installation plan. If you'd like to email your plan but you don't know who your account manager is, simply send it to sales@warmlyyours.com. Your email will be routed to an account manager who can help you. If you'd like to fax your plan, our fax number is 800-408-1100. Getting a SmartPlan™ installation plan will make sure you have all the information you need to get your project started, so be sure to start smart! 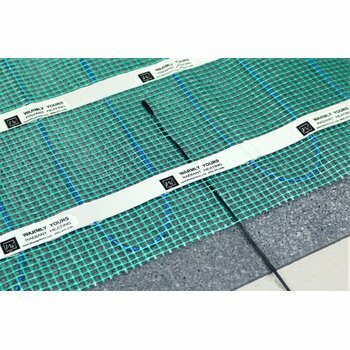 Plus, if you plan to install the radiant floor heating system yourself, give our technical experts a call with any questions. Our experts are available 24/7 at 800-875-5285. For more information, visit www.warmlyyours.com.